What is the best coffee bean grinder for me? We all love the speed, efficiency and lack of mess which using pre-ground coffee granules or pod machines brings. But sometimes, there is just nothing better than preparing a cup of coffee from fresh, and this means grinding the beans yourself. If you don’t have the luxury of having a bean to cup machine which does all of this for you, you probably have been looking at separate grinders. Only a few minutes exploring the availability will have probably confused you as there are just so many. Do you need a burr or blade machine? Is hand or electric better? What even are the differences? 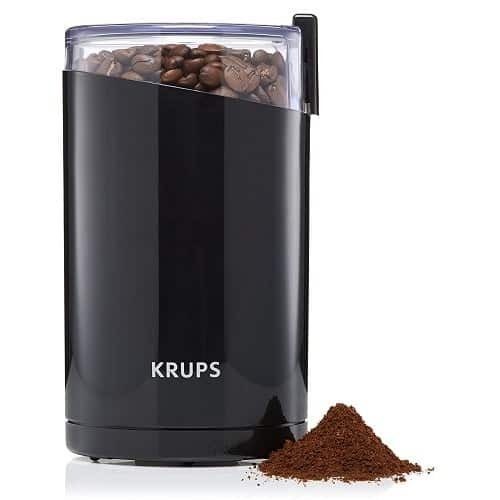 With two stainless steel blades and a 180W motor, this Krups grinder faces no problems with chopping and cutting your coffee beans. The single speed helps to keep you on top of the grinding mechanism, as you simply know that the longer you blend for, the finer the powder becomes. No messing about with a bunch of settings, just a bit of manual monitoring. It is important to remember to follow the instructions carefully. Just like with any blender, you should always use it for 20 seconds maximum and then give it a break for a minute, although we would say to cut this down further to about 15 seconds as a slight burning motor smell starts to emerge. The 75g capacity is enough to make up to 15 small cups of coffee at one time, which is great if you are entertaining. There is nothing to stop you only preparing enough for two cups, of course. Electrical devices can always bring an element of danger to your kitchen, especially when they include blades and sharp pieces. The safety switch will prevent the mill from operating unless the lid is locked safely in place, so not only will there be no pieces of coffee flying everywhere, but no hands can come anywhere near the blades while they are at work. Other users have commented that it is also useful to grind things such as peppercorns, seeds, oats and cloves into a fine powder, so if you are a frequent baker or cook as well as a coffee lover, it could be a perfect 2-in-1 item. To clean, all it needs is a bit of attention with a small brush. There are dedicated options available, but we have found in the past that an unused paintbrush is perfectly adequate. Then just give it a wipe with a damp cloth if there are any marks. Because it is electric, it isn’t recommended that you wash it in water, and you can’t take it apart to care for every part separately, unfortunately. The Kingtop grinder is the perfect example of not needing to spend a huge amount of money for a quality product. Working at a high speed of 20,000-30,000 rpm, it can tackle beans quicker than a lot of other electrical blade machines. Simply pulse for around 2-3 seconds, give it a little break, and go again until you have the desired consistency. A coarse grind will only take around 8-10 seconds in total and a fine ground about 10-15 seconds. There is a little cleaning brush included so you can get rid of any particles which are stuck around the blade area after use, as it isn’t recommended you wash the device with water. We would also suggest that, before you unscrew the lid of the storage tub, you give the edges a bit of a tap. Some powder does sit around the lip of the container, which then spills when opened, but this seems to clear it so there’s no mess. When in use, the machine is relatively quiet for a blade device. It comes with a spare blade too, which initially made us think it wasn’t going to be any good and would give up with the first hint of a challenge. How wrong we were. As long as you follow the instructions, it doesn’t seem to be losing its efficiency anytime soon. So, it looks just to be a thoughtful addition. We like the stainless steel finish, which keeps it looking new and clean as well as feeling very sturdy. When it isn’t being used, the cord can be wrapped around the base and tucked away, so everything is tidy and safe. With a transparent lid, this Andrew James offering is great for anyone who likes to have full control over the consistency of their beans. You can see how the grinding process is coming along, so whether enough has been done or they need another little blast. All you do is turn the machine on with the switch, and then off again when you need to have a pause or are finished. This degree of control is something which a lot of people will probably like, especially if your tastes regularly change depending on how you feel and your chosen blend for the day. The angled, tapered design seems to mean the majority of the beans are chopped by the blades pretty quickly with none left behind in corners or too far away from the blade. It is also quite shallow, so even though you can’t wash it in water, it is easy to wipe around if you’re careful of the blades. Looking at the beans is, unfortunately, the only way to see the progress. There’s no indicator lights or settings to change, so it is a big guessing game essentially, and you’ll get the right result if you strike lucky. Thankfully, it seemed to be the case that we were more lucky than unlucky. But for the price, it is an effective little kitchen companion for any coffee lover. Grinding experts would always to say to go with a burr grinder, but this small electrical device is affordable and does the job better than some other more expensive blade grinders available. It will hold 70g of beans too, which is enough to make 10 cups. Nothing to stop you making some ahead to save a bit of time. Fancy an affordable grinder which will match the rest of your Bodum collection? The perfect companion to the French Press or travel mugs from the brand, this blender will quickly turn whole beans into coarse granules and finer powder with the simple hold down of the large red button on the lid. With a bit of practice, you can get this absolutely perfect for your tastes. Because of this, it can’t operate without the lid being firmly attached which is great for safety. Also great for safety is the grip available, which is a common feature of all Bodum pieces. If it is working particularly hard and starts to go a bit wobbly, it is sturdy so will not tip over, but holding it may help you get a better press on the button. Thanks to the rubber body, holding it is comfortable. There are eight colour options – black, lime green, red, matte black, matte white, off-white, silver and copper. The power button is always either red or black and contrasts with the rest, which adds an extra element to the design. When it is time to store it all away, a cord wrap on the bottom of the machine will keep everything untangled and in one place, without wires trailing about or getting in the way. Even if you want it on display, you can do so without unsightly power cables spoiling the look. The inside of the blender is easy to reach and shallow enough to be able to wipe or brush out after use, so even if you are grinding oily products such as certain beans or even seeds, this excess product won’t build up if you keep on top of it. For its size, this blade grinder holds a surprising amount of beans, making it ideal for larger households or anyone who likes to plan ahead with their coffee grinding schedule. With the capacity to grind between 4 and 12 cups of beans, it is surprisingly powerful and should cater to any need. The transparent powder holder is not only removable, but you can easily check on the update of how the grinding is getting on. To help you out a little bit, there is also a set of LED lights which indicated the consistency of the grind. It will turn red when your desired level is reached, on coarse, medium and fine, so there is a lot less guessing involved than with a lot of other models in a similar price range. This indicator seemed to be pretty accurate, so there was no disappointing ‘opening of the jar to find it hadn’t quite worked’ moments. Just remember to constantly hold down the grinding operation for the lights to work; we kept pausing after a few seconds at first which seems to reset the entire process. We will say that it is definitely one of those devices which seems to work better when fuller rather than empty. It coped better when filled up to the maximum line, rather than putting the very minimum in. For this reason, we would say that it isn’t an option for anyone who just makes one cup at a time or likes to grind as they go rather than preparing it and storing. There is a little brush included for cleaning it out and quite a generous power cable length. You can wind any unused cable around the base when not needed. In all, it seems like a good little product you could get plenty of use out of for the price. A simple machine which can grind beans to any consistency, judged by the time you hold the power button down. It will hold enough to make 15 cups of coffee and is also perfectly capable in grinding seeds, nuts and whole grains. We found it to be relatively quiet when in use compared to the other similar models in its price/size range, and even though it will only be in use for a few minutes and for about 10 seconds at a time, it still helps not to wake everybody up when you’re preparing your morning brew. Filling it towards the maximum end of the capacity scale does seem to make the process a bit messy; when taking off the lid, there are a few bits of coffee and powder which seem to have got stuck around the edge and fall. But this isn’t particularly a rare factor with these smaller scale machines. Cleaning is slightly difficult, as there were a few clumps of coffee left by the rotor when we emptied it. But it isn’t anything a wipe with a bit of kitchen paper and a brush out won’t fix – it may just occasionally need a careful scrape out. The sleek, oval design means it fits away easily in cupboards if you don’t want to leave it out, but will also not take up that much room on benches. There are a couple of things missing compared to some of the very similar designed fellow models, such as no winder for the power cord and no cleaning brush included, but we don’t feel this takes away from the experience of using the machine at all. In fact, when you’re saving a bit of money, we think they are things you could happily do without. The perfect cup of coffee needs the perfect amount of beans and the precise grinding level. This can result in a lot of experimentation, failed attempts and lacklustre mugs before you get it right. This is where the Sage Grinder Pro steps up to the task. Thanks to Dosing IQ Technology, no matter how many beans you use, the desired results will be achieved. There are programmable time, cup and dose settings, as well as being able to set the machine you’ll be using. You can adjust the strength without altering the number of cups too, which is handy. In fact, there is a total of 60 grind settings in all. If you have found your perfect grind setting by adjusting the settings manually, you can save this for easy access at a later date. All the grounds are dropped into the basket and ready to be used straight away. There is a vacuum pot included, so you can grind your coffee down in preparation for a later date and keep it fresh for when it is needed which we thought was a nice touch. No beans got trapped in the hopper when we used it, no matter the amount we used, and removing the basket which holds the grounds was also really easy and – most importantly – didn’t result in coffee granules spilling all over the kitchen surface. Yes, it is the most expensive option by quite a little bit. But it is for the serious coffee lovers who find grinding their coffee beans to be the best way to get that perfect taste. If you are after a grinder, taste is probably one of the main factors in your cup of coffee anyway. And it isn’t like the money is wasted. This was the best performing coffee bean grinder we tested by far thanks to the wide range of settings and effectiveness. Bodum is a well-loved brand when it comes to all areas of coffee preparation and drinking, and if you have some other products in the range, this is the perfect addition. Whether you be using their French Press, or you take one of their thermos flasks on your commute to work, this little device can prepare the coffee granules you will need for the best-tasting coffee under the circumstances. The conical burrs crush the beans rather than slicing and chopping them as blades would, which preserves some of the flavours and also means consistent results are delivered. Adjusting the level of grinding is easy enough; you just twist the upper bean container to choose one of the 12 programmed settings. Coffee grinds fall into the borosilicate glass container included, which is static-free so you won’t get any granules jumping around or sticking to the pot when you go to empty it. Looks-wise, it has all the typical Bodum styling aspects. There is a rubber grip surrounding the glass jar, and the entire body of the grinder is made from soft rubber. This does make it look a bit like a garden power tool, but on a more positive note allows it to match other products in the Bodum range well. Black, red, silver, copper and off-white are the choices, so whether you want an exact match or a pop of colour, there should be an option for you. A push button operates everything, and as well as being able to adjust the grinding level there is also a pre-set timer so you can set the number of seconds it runs for depending on the result you want. It does take a bit of experimentation to get exactly right, and the burr is stainless steel, so we don’t feel it is as effective as the ceramic alternatives, but it is still a great option. Tall and slim, this is the best option for a grinder which can be carried in a rucksack or picnic bag so you can make coffee away from home. It makes the perfect granules for Aeropress, French Press travel mugs, percolators and drip/pour on devices, with 18 settings to choose from regarding the size of the grains. If you like your beans to be very finely ground for making Turkish coffee-style beverages, then this is a product which has been designed with you in mind too. The stainless steel body makes it a safer option for carrying around too. It won’t smash in your bag, and the slimline, vertical design makes it easier to grip as well. Some other travel grinders are short and shaped like flasks, which can make holding them while in use a task. The handle just pushes on and pulls off when you want to pack it away. You have to pull the handle off every time you want to fill with beans, but it is simple enough. Although we’d suggest being careful, as too much of this could result in the fastening wearing away slightly. Unlike some of the other hand grinders, we see no reason why this one could not also be used to grind seeds and spices if you wish, although a good clean will be needed after each item as to not transfer any taste. Sometimes, a travel device wouldn’t be up to the job of home use. They’re usually not as efficient and are only meant to be a backup/second option. But the Midas Upgrade-Grind could well be used at home and give you a great result if you don’t mind the fact it takes a bit longer than electric versions. One of the most popular hand grinders on the market over the past few years, thanks to its ergonomic, timeless design and adjustable grind size. With the ability to grind your beans into a fine powder for espressos, and leave them a bit coarser for iced coffees, this is a product which can cater to any tastes or coffee varieties. It is also very reliable; the ceramic burrs will last longer than stainless steel versions, and they’re seen as being a lot more consistent too. As it is a hand model, it is only really suitable for grinding small amounts of beans at any one time. But it does seem quite strong and stable, so there is nothing to stop it being used regularly from what we can see. Adjusting the settings for the coarseness of the grind isn’t obvious at first, but if you take the grinding handle off you, will see a little screw/washer. The further you turn it right, the tighter the mechanism will get and the finer the coffee will be. Hand grinders will unsurprisingly take longer than their electric counterparts. Not only do you have to go a bit slower, but it is also more effort. It will take about 2 minutes to fully grind enough coffee for one cup, but the flavour at the end does seem to be relative to the time spent. Essentially, it is a product for anyone who wants the effectiveness and consistency of a burr grinder but doesn’t want to fork out for an electrical device. On the downside, it is more expensive than the majority of other manual options on the market. We understand that you pay for quality, but there are versions which aren’t far off for less than half the price. But the simplistic nature means not much can go wrong with the mill, and all the individual parts seem quality so it should last for years to come. Small and lightweight, this grinder would be the perfect addition to any camping trip or day out for anyone who simply can’t let being away from home keep them from their coffee fix. You could even take it to work with you or keep it in your caravan as an affordable, practical grinder which doesn’t require power. The glass bottle feels strong enough to suffer from a slight bit of wear and tear, and there is also a silicone lid for this part if you want to pre-grind the coffee ready for when you need it next. The cap is a high standard, so no moisture or air will get into the jar. It is labour-intensive, so not for those who are always in a rush or hate putting effort into their cup of coffee. But for the price, the quality of the coffee grains at the end is decent. The granules aren’t all uniform, which is usually something a burr grinder avoids, but your coffee machine will hopefully not see this as an issue. The uneven results come from there being no bearings in the burr, which usually stops them both swinging from side to side. It isn’t the end of the world, as a bit of patience and time can make this less of a problem. Trial and error will sort it all out. The low price also means that if you want to see what all the fuss is about with grinding your own beans, it is achievable on a budget. Manual coffee grinders have been around for years and years. It is a traditional method, which came long before you were able to buy pre-ground versions. So, if you want to make a nod towards this history and purchase an antique, vintage style coffee grinder, this is your pick. The crank mill is easy to turn, as it is situated at the side of the machine rather than on the top like many modern varieties which we liked. It is also perfect for grinding any type of seed, herb or spice thanks to the lack of blades. The mechanisms are mostly made of cast iron which means they’re strong and won’t wear away, and we liked how the grinds fell into a small wooden compartment once they were ready for another traditional feel, which also adds to the aroma. It takes ages to grind the beans, just like with any other manual device. It isn’t one for the regular coffee drinker or anyone who wants exact precision and perfection from the results. But for anyone who loves the idea of displaying such an item on their coffee station or kitchen worktop, but still wants to occasionally use it about once a day, it is a great buy. The price isn’t bad – there are a couple of cheaper options available, but with this model, you are also paying for the build and style, as well as the quality. For a retro look which not only does a good job but looks brilliant on display, this Fecihor is the best vintage coffee grinder we found. These are generally the cheap and cheerful options, acting as a kind of blender which uses blades to chop the contents. You are basically grinding your beans down in the same way you’d make a smoothie. Manufacturers usually will give a recommended bean amount to use in grinders, which should yield the best results. Over- or under-filling the machine could mean a lot of inconsistency. The best results are achieved by using the blades in spurts rather than all in one go, leaving a bit of a break in between cycles. This is because they bash, chop and break the beans down all at one time. Not everyone will necessarily get the same amount of attention. The beans go from whole to coarse grinds to finer grinds the longer the machine goes on. Because they are so powerful and require a lot of time to grind into a fine powder, there is a risk that if they over-grind the beans, they could burn them. The blades create friction, which in turn generates heat, which in turn can burn the beans and cook the oils which have been released. You may or may not be able to taste this in the coffee. Finer grounds also create a more mellow taste, but larger is seen as more powerful or bitter. This could give you a mixed taste of coffee, but it all boils down to how you like it. However, if you follow instructions and run the machine for a few seconds and then give it a break to cool down, this should solve this issue. Modern devices are a lot more capable than the original models. Blade grinders are commonly also used for nuts, spices, seeds and breadcrumbs. Burr grinders are the option which most coffee connoisseurs would pick, as they generally achieve a much more consistent result and in a lot less time. If taste is a big factor for you and you can really tell the difference between blends, flavours and granule sizes, then a burr could be the best choice. They work by grinding the beans down between two rotating flat surfaces, milling them almost. This means that nearly every bean gets the same amount of attention and power until the required consistency is achieved. Think of the way a pestle and mortar works, but with a lot more effectiveness. Most are adjustable, so can grind beans into different sizes by moving the surfaces closer together. Whether an electrical or manual coffee grinder is the best option depends on whether you want the work done automatically with the press of a few buttons, or prefer the traditional method. Some say that the more effort you put in, the better the results, after all. Bladed options are usually electrical, so the correct amount of necessary power can be achieved, but burr grinders can be both hand or electrical. The latter option usually caters to a larger number of beans, and perhaps in a more commercial environment. A bonus of having a manual device is that it can be portable, so you can use it as a travel grinder to accompany an Aeropress or a travel Moka pot. If you already have your coffee machine, there may be certain limits as to which grind of coffee you can use. Cafetières usually require a coarser grind to ensure no bits escape through the press, but a filter machine may just need a very fine blend if the mesh traps everything but the liquid. Bear this in mind before you buy a grinder. As well, espressos require a finer grind than most other coffee types to get the job done a bit quicker, but there also needs to be a shorter time between grinding and brewing to lock in more flavour. An electrical burr grinder is the best option. Sometimes it boils down to taste as well. Coarser grinds usually result in a stronger, occasionally more bitter taste, but finer grinds (such as instant coffee) are often weaker. Should your taste buds be pretty well defined to the tastes of coffee, a high-end electric burr grinder may be the best pick for the best results. If you simply want the next step up from instant or all coffee tastes the same, think about whether you’d be able to tell the difference between a blade grinder which costs £30 or one that costs £300. If you live in a large household and you all have coffee at the same time, you’ll need an option which will accommodate enough beans and also be able to cope with the pressure. But should you live on your own or just in a couple, a smaller manual machine could just be sufficient. Likewise, if you buy expensive beans, you want to treat them in the best way possible. Supermarket value beans will likely taste the same in either machine no matter how they are ground. Hand burr grinders and cheaper blade grinders can be found for below £20, and can increase to around £50. Electrical burr grinders are usually around double this as they have larger capacity and often more control and automation over the entire process. It is important to remember that a higher price doesn’t necessarily mean a better quality product with some of the blade and manual models. Can I prepare flavoured coffee in the same grinder? This is not recommended. Flavour extracts, such as oils, will coat the grinder material when in use, and these oils and aromas are basically impossible to remove. They can be cleaned of course, but the more they are used, the harder it would be to remove all traces of the previous coffee product. You don’t want to risk spoiling the flavour of your flavoured coffee with your strong morning flavour. The same applies if you occasionally like decaf rather than caffeinated. Depending on your model, you may be able to purchase a second container. Electrical machines cannot be cleaned with water apart from wiping them with a damp cloth. Always allow to dry thoroughly before using again. The internal workings are usually easy to access, and if a cleaning brush does not come with the product, you can easily use a small paintbrush or toothbrush to sweep away any excess powder left behind. Non-electrical items can often be wiped or washed with water and taken apart easier, but always follow manufacturer’s guidelines – you don’t want to get water on it if it will affect the workings.